With its NVIDIA® G-SYNC™ technology, the 24" (61 cm) G2460PG from AOC's Style Line immerses the player right into the gaming action. The integrated G-SYNC module synchronises the display refresh rates to the graphics card’s GPU so nothing comes between the player and the game. The extremely short response time of just 1 ms effectively eliminates ghosting effects, delivering crisp and clear images even in the most intense in-game situations. Thanks to the outstanding refresh rate of the G2460PG, enemy movement is displayed in ultra-smooth motion and competitors can be easily targeted. Not only do the in-game environments come to life in one super-smooth movement, but also at a 1920 x 1080 Full HD resolution. Thanks to a luminosity of 350 cd/cm² colours are vibrant and bright. In addition, the G2460PG supports DisplayPort for fast and seamless image transmission. With its 27" (69 cm) TN panel, the G2770PQU is the largest monitor in the display expert’s gaming portfolio. It boasts the same excellent refresh rate and equally speedy response times as AOC's other gaming specialists. This monitor is especially suited for players who like to enjoy their games from a greater distance. With its large display, gaming-enthusiasts will enjoy an intense and realistic experience with a real competitive edge. In addition to its impressive performance, the G2770PQU offers a great variety of connectivity options including MHL support for Android devices, comprehensive ergonomic adjustment functions and integrated stereo speakers. Many hours of gaming can strain the eyes, which often evokes fatigue and nervousness. AOC i-care detects the intensity of surrounding light and automatically adjusts the monitor brightness according to different light intensities. This way the eye strain can be effectively reduced and gamers can comfortably play for longer periods with less fatigue. Roll on, winter: With their impressive gaming recommendations, AOC monitors are perfect for cold winter days spent indoors. The display specialist offers monitors for all budgets. A great opportunity to treat your loved ones with a feature-rich gaming monitor for Christmas. G2460PG: This monitor with integrated NVIDIA G-SYNC technology synchronises the display’s refresh rates to the graphic card’s GPU. 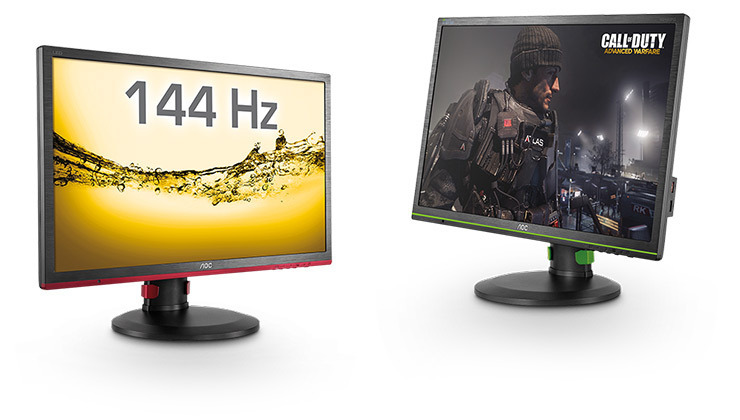 G2460PQU/BR: With a refresh rate of 144 Hz this monitor takes gaming performance to the max — at an affordable price. G2770PQU: A display which adds extra space to the gaming experience and boasts excellent refresh rates as well as speedy response times. G2460FQ: Non-stop action for thrill-seeking gamers at an affordable price. The 24" (61 cm) G2460PG is available at an MRSP of £ 369. The MRSP of the G2460FQ lies at £ 189.99. The 24" (61 cm) AOC G2460PQU/BR is available at £ 219 and the 27" (69 cm) G2770PQU sells for an MRSP of £ 299.99.